Ableton Link has already proven itself as a way of syncing up Ableton Live, mobile apps (iOS), and various desktop apps (Reason, Traktor, Maschine, and more), in various combinations. Now, we’re seeing support for live visuals and VJing, too. Three major Mac apps have added native Ableton Link support for jamming in the last couple of weeks: CoGe, VDMX, and a new app called Mixvibes. Each of those is somewhat modular in fashion, too. Oh, and since the whole point of Ableton Link is adding synchronization over wireless networks or wired networking connections with any number of people jamming, you might use both apps together. VDMX is perhaps an even bigger deal, just in terms of its significant market share in the VJ world, at least in my experience. This means this whole thing is about to hit prime time in visuals the way it has in music. That could easily be a subject of a separate story on CDM, but open source in visuals have helped make live performance-ready video (Vidvox’s own open Hap), made inter-app visuals a reality (Syphon), and has built a shader format that allows high-performance GPU code to be shared between software. I actually forgot to include this one – I’m working o a separate article on it. Mixvibes is a new app for mixing video and audio samples in sync. It was just introduced for Mac this month, and with sync in mind, included Ableton Link support right out of the gate. (That actually means it beat the other two apps here to market with Link support for visuals.) It runs in VST and AU – where host clock means Link isn’t strictly necessary – but also runs in a standalone mode with Link support. This is well worth a look, in that it stakes out a unique place in the market, which I’ll do as a separate test. So that’s two great Mac tools. 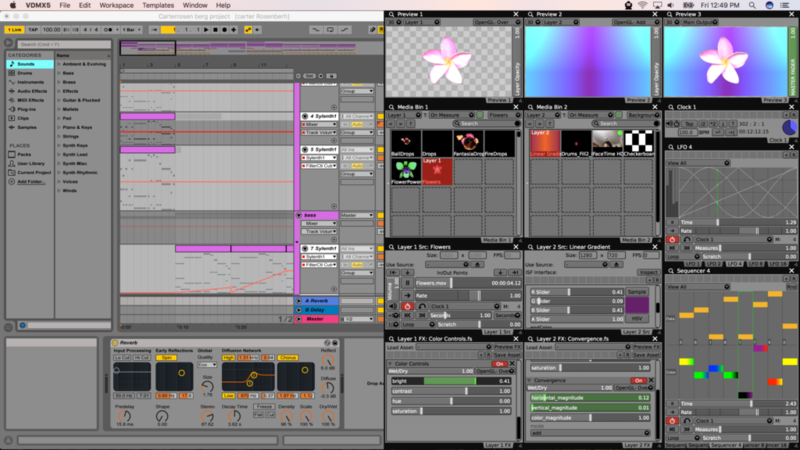 There’s nothing I can share publicly yet, but I’ve heard other visual software developers tell me they plan to implement Ableton Link, too. That adds to the tool’s momentum as a de facto standard. Now, getting together visuals and music is easier, as is having jam sessions with multiple visual artists. You can easily tightly clock video clips or generative visuals in these tools to song position in supported music software, too. I remember attending various music and visual jams in New York years ago; those could easily have benefited from this. It’ll be interesting to see what people do. Watch CDM for the latest news on other visual software; I expect we’ll have more to share fairly soon.